1. A consistent and complex whole made up of correlated and semiindependent parts. A complex of functionally related anatomic structures. 2. The entire organism seen as a complex organization of parts. 3. Any complex of structures anatomically related (for example, vascular system) or functionally related (for example, digestive system). 4. A scheme of medical theory. 5. System followed by one or more letters denotes specific amino acid transporters; system N is a sodium-dependent transporter specific for amino acids such as l-glutamine, l-asparagine, and l-histidine; system y+ is a sodium-independent transporter of cationic amino acids. 6. A group of people, agencies, institutions, and activities or protocols that together deliver parts of the overall health maintenance or intervention to mitigate injury or disease in the general public (that is, systems of health care delivery). 2. a school or method of practice based on a specific set of principles. auditory system the series of structures by which sounds are received from the environment and conveyed as signals to the central nervous system; it consists of the outer, middle, and inner ear and the tracts in the auditory pathways. autonomic nervous system the portion of the nervous system concerned with regulation of activity of cardiac muscle, smooth muscle, and glands, usually restricted to the sympathetic and parasympathetic nervous systems. Bethesda System a classification of cervical and vaginal cytology used in cytopathologic diagnosis. cardiovascular system the heart and blood vessels, by which blood is pumped and circulated through the body. CD system [c luster d esignation] a system for classifying cell surface markers expressed by lymphocytes based on a computer analysis grouping similar monoclonal antibodies raised against human leukocyte antigens. central nervous system (CNS) the brain and spinal cord. centrencephalic system the neurons in the central core of the brain stem from the thalamus to the medulla oblongata, connecting the two hemispheres. chromaffin system the chromaffin cells of the body considered collectively. circulatory system channels through which nutrient fluids of the body flow; often restricted to the vessels conveying blood. colloid system , colloidal system see colloid (2). conduction system of heart a system of specialized muscle fibers that generate and transmit cardiac impulses and coordinate contractions, comprising the sinoatrial and atrioventricular nodes, bundle of His and its bundle branches, and subendocardial branches of Purkinje fibers. digestive system the organs concerned with ingestion, digestion, and absorption of food or nutritional elements. endocrine system the glands and other structures that elaborate and secrete hormones that are released directly into the circulatory system, influencing metabolism and other body processes; included are the pituitary, thyroid, parathyroid, and adrenal glands, pineal body, gonads, pancreas, and paraganglia. enteric nervous system the enteric plexus, sometimes considered separately from the autonomic nervous system because it has independent local reflex activity. extrapyramidal system a functional, rather than anatomical, unit comprising the nuclei and fibers (excluding those of the pyramidal tract) involved in motor activities; they control and coordinate especially the postural, static, supporting, and locomotor mechanisms. It includes the corpus striatum, subthalamic nucleus, substantia nigra, and red nucleus, along with their interconnections with the reticular formation, cerebellum, and cerebrum. heterogeneous system a system or structure made up of mechanically separable parts, as an emulsion or a suspension. His-Purkinje system a portion of the conducting system of the heart, usually referring specifically to the segment beginning with the bundle of His and ending at the terminus of the Purkinje fiber network within the ventricles. homogeneous system a system or structure made up of parts which cannot be mechanically separated, as a solution. hypophysioportal system , hypothalamo-hypophysial portal system the venules connecting the capillaries (gomitoli) in the median eminence of the hypothalamus with the sinusoidal capillaries of the adenohypophysis. immune system a complex system of cellular and molecular components having the primary functions of distinguishing self from not self and of defense against foreign organisms or substances. International System of Units see SI unit, under unit. keratinizing system the cells composing the bulk of the epithelium of the epidermis, which are of ectodermal origin and undergo keratinization and form the dead superficial layers of the skin. limbic system a group of brain structures (including the hippocampus, gyrus fornicatus, and amygdala) common to all mammals; it is associated with olfaction, autonomic functions, and certain aspects of emotion and behavior. locomotor system the structures in a living organism responsible for locomotion, in humans consisting of the muscles, joints, and ligaments of the lower limbs as well as the arteries and nerves that supply them. lymphatic system the lymphatic vessels and lymphoid tissue, considered collectively. lymphoid system the lymphoid tissue of the body, collectively; it consists of (a) a central component, including the bone marrow, thymus, and an unidentified portion called bursal equivalent tissue; and (b) a peripheral component consisting of lymph nodes, spleen, and gut-associated lymphoid tissue (tonsils, Peyer's patches). lymphoreticular system the tissues of the lymphoid and reticuloendothelial systems considered together as one system. masticatory system the bony and soft structures of the face and mouth involved in mastication, and the vessels and nerves supplying them. metric system a decimal system of weights and measures based on the meter. mononuclear phagocyte system (MPS) the set of cells consisting of macrophages and their precursors (blood monocytes and their precursor cells in bone marrow). The term has been proposed to replace reticuloendothelial system, which does not include all macrophages and does include other unrelated cell types. muscular system the muscles of the body considered collectively; generally restricted to the voluntary, skeletal muscles. nervous system the organ system which, along with the endocrine system, correlates the adjustments and reactions of the organism to its internal and external environment, comprising the central and peripheral nervous systems. parasympathetic nervous system the craniosacral portion of the autonomic nervous system, its preganglionic fibers traveling with cranial nerves III, VII, IX, X, and XI, and with the second to fourth sacral ventral roots; it innervates the heart, smooth muscle and glands of the head and neck, and thoracic, abdominal, and pelvic viscera. peripheral nervous system all elements of the nervous system (nerves and ganglia) outside the brain and spinal cord. portal system an arrangement by which blood collected from one set of capillaries passes through a large vessel or vessels and another set of capillaries before returning to the systemic circulation, as in the pituitary gland and liver. Purkinje system a portion of the conducting system of the heart, usually referring specifically to the Purkinje network. respiratory system respiratory tract; the tubular and cavernous organs that allow atmospheric air to reach the membranes across which gases are exchanged with the blood. reticular activating system the system of cells of the reticular formation of the medulla oblongata that receive collaterals from the ascending sensory pathways and project to higher centers; they control the overall degree of central nervous system activity, including wakefulness, attentiveness, and sleep; abbreviated RAS. reticuloendothelial system (RES) a group of cells having the ability to take up and sequester inert particles and vital dyes, including macrophages and macrophage precursors, specialized endothelial cells lining the sinusoids of the liver, spleen, and bone marrow, and reticular cells of lymphatic tissue (macrophages) and bone marrow (fibroblasts). See also mononuclear phagocyte s.
SI system see under unit. stomatognathic system structures of the mouth and jaws, considered collectively, as they subserve the functions of mastication, deglutition, respiration, and speech. sympathetic nervous system (SNS) the thoracolumbar part of the autonomic nervous system, the preganglionic fibers of which arise from cell bodies in the thoracic and first three lumbar segments of the spinal cord; postganglionic fibers are distributed to the heart, smooth muscle, and glands of the entire body. urinary system the organs and passageways concerned with the production and excretion of urine, including the kidneys, ureters, urinary bladder, and urethra. urogenital system the urinary system considered together with the organs of reproduction. visual system the series of structures by which visual sensations are received from the environment and conveyed as signals to the central nervous system; it consists of the photoreceptors in the retina and the afferent fibers in the optic nerve, chiasm, and tract. 1. A group of interacting, interrelated, or interdependent elements forming a complex whole. 2. An organism or body as a whole, especially with regard to its vital processes or functions. 3. A group of physiologically or anatomically complementary organs or parts. 1 a collection or assemblage of parts that, unified, make a whole. Physiological systems, such as the cardiovascular or reproductive system, are made up of structures specifically able to engage in processes that are essential for a vital function in the body. 2 a set of computer programs and hardware that work together for some specific purpose. People, hardware, software, applications and/or methods organised to accomplish a set of specific functions or objectives. A defined collection of related structures and processes and the components required for their function. See ABO system, Admission-discharge-transfer system, Adrenergic system, Aldrete Recovery Room Scoring system, All-payer system, Allocation system, Alternate delivery system, Auditory system, Autonomic nervous system, Barotypic system, Bartenieff fundamentals system, Beta-Cath system, Bethesda system, BioLogic-HT™ system, BioZ system, Bonus system, Buddy system, Central nervous system, CHARS, CHESS system, Circulatory system, Clinical laboratory information management system, Closed system, Closed loop system, Community support system, Community water system, Computer-assisted diagnostic system, Computerized thermal imaging system, Conduction system, Consecutive water system, Cotswolds Staging system, DBx diagnostic system, Decision support system, Digestive system, Disease simulation system, Distribution system, Dual review system, Dynamic system, Early warning system, Eclipse system, Enterprise liability system, Er:YAG laser system, Executive information system, Expert system, Expression system, Extrapyramidal system, Feedback system, FIGO staging system, Fluoridated water system, Fountain™ system, Freehand system, Genitourinary system, Geographic information system, Gleason grading system, Global positioning system, Graham system, Groundwater system, Hamilton score system, Hepatic portal system, Hospital information system, HCPCS system, Humoral immune system, Immune, system, Incardia CABG system, Incardia valve system, Individual water system, Injury Surveillance system, Integrated delivery system, Kallikrein-kinin system, Laboratory information system, Lane system, Legacy system, Lewis system, Limbic system, Linear system, Lymphatic system, Lyophilized liposomal delivery system, Magnocellular system, Management information system, Medical anthrotonic system, Medication Event Monitoring system, Medipatch™ system, MICRO21 automated microscope system, MIDCAB™ system, Mirizzi system, Mission-critical system, MLR system, Model system, Mononuclear phagocytic system, Morter HealthSystem, Mossy fiber system, Mountain staging system, Multiaxial system, Multipayer system, Multiple chemical sensitivities system, NADPH oxidase system, National Health system, Natural-Hip system, Natural-Knee system, Naturally fluoridated water system, Nervous system, Neuroendocrine system, Noncommunity water system, Nonlinear system, Open protocol system, Nontransient system, Operating system, Opioid-mediated analgesia system, OSCAR system, PACS system, Papile system, Parvocellular system, Patient accounting system, Pedicle screw fixation system, Pluralistic system, Pneumatic tube system, Prognostic scoring system, Prospective payment system, Prostar system, Public water system, Pyramid system, Quartet™ system, Quinton® Synergy™ cardiac information management system, RAI staging system, Read classification system, Red system, r/LS system, Remote Automated Laboratory system, Renin-angiotensin-aldosterone system, Reproductive system, Respiratory system, Revelation™ hip system, Rh system, Rosenkranz™ pediatric retractor system, Rye Staging system, Sabolich socket system, SalEst™ system, School water system, Second messenger system, Sentinel™ 2010 implantable cardioverter-defibrillator system, Sharplan™ SilkTouch laser system, Side Branch Occlusion system, Silhouette laser system, Simal cervical stabilization system, Single-payer system, SkinLaser™ system, Skinlight erbium-YAG laser system, SomnoplastySM system, Sonic accelerated fracture healing system, Static system, Station system, Stress system, Subsystem, Svennerholm system, Sydney system, Sympathetic nervous system, Television rating system, Thermochemic HT™ system, Thermoflex™ system, Thoratec® VAD system, Tort system, Total hip system, Total knee system, Trusted system, Two-tiered system, Unified health care system, Vacuum system, Vestibular system, Voluntary Resident Tracking system, Walter Reed Staging system, Withhold system. 1. A consistent and complex whole composed of interrelated and interdependent parts. 2. Any complex of structures related anatomically (e.g., the vascular system) or functionally (e.g., the digestive system). 3. The entire organism seen as a complex organization of parts. 4. A method of denoting amino acid transporters in which the word system is followed by one or more letters indicating the specific transporter (e.g., system N is a sodium-dependent transporter specific for amino acids such as l-glutamine, l-asparagine, and l-histidine; system y+ is a sodium-independent transporter of cationic amino acids). 6. A way of classifying (e.g., the taxonomic system). A group of related organs that act together to perform a common function. Body systems include the digestive system, the respiratory system, the cardiovascular system, the urinary system and the reproductive system. 1. A group of body organs serving a common function (e.g. the nervous system). 2. A combination of parts or things forming a unitary whole (e.g. optical system). 3. A method of arrangement or classification. sympathetic nervous system dominates in stressful situations causing a 'fight or flight' response, while the parasympathetic nervous system primarily regulates those activities that conserve and restore energy. Acetylcholine is the neurotransmitter for sympathetic and parasympathetic preganglionic neurons and for postganglionic parasympathetic neurons, which act on muscarinic receptors, while noradrenaline (norepinephrine) is the neurotransmitter for all postganglionic sympathetic neurons (except for the sweat glands) which act on adrenergic receptors. See acetylcholine; adrenergic receptors. boxing system A method of measurement of the eyesize of spectacle frames. It is based on a rectangle with its horizontal and vertical length tangential to the edges of the lens. The horizontal lens size is equal to the horizontal length of the rectangle. Syn. box system of lens measurement; boxing method. See boxing centre; standard optical position centre. catadioptric system An optical system employing both reflecting and refracting components as used, for example, in a lighthouse. This design makes long focal length more compact and mirrors, unlike lenses or prisms, are free of chromatic aberration. See catadioptric image. central nervous system (CNS) The largest part of the nervous system, comprising the brain and the spinal cord. The brain is encased and protected by the skull and the spinal cord by the vertebrae, as well as the meninges and the blood-brain barrier that protects against blood-borne toxins. The central nervous system processes and integrates sensory information received from the peripheral nervous system and issues appropriate motor responses. centred optical system See optical system. compound optical system An optical system consisting of more than one lens (e.g. the eyepiece of a telescope). immune system A complex system that protects the body against infection, disease and malignant cells by producing the immune response. The system includes skin and mucous secretions, white blood cells (leukocytes), lymphocytes (B cells and T cells), killer T cells, complement system (proteins in the blood) and antibodies. Disorders of the immune system can cause disease: they include immunodeficiencies due to aging, alcoholism, malnutrition, etc., immune responses against its own cells (autoimmunity), or damaging effects caused by the immune system (hypersensitivity). See autoimmune disease; hypersensitivity. magnocellular visual system That part of the visual pathway from the photoreceptors in the retina to layer 4Cα (and to a lesser extent in layer 6) of the visual cortex and then projected to area V5, which is mainly responsible for transmitting information about movement, depth perception and high contrast targets. Action potentials are transmitted faster in this pathway because of the large diameter axons of these neurons than in the parvocellular pathway. Syn. dorsal stream; parietal pathway; transient visual system; 'where' system. See M cell; dyslexia; lateral geniculate bodies; two visual systems theory. optical system A collection of lenses, prisms, mirrors, etc. which act together to produce an image of an external object. If the axes of all the components coincide, the system is called a centred optical system. parvocellular visual system That part of the visual pathway from the photoreceptors in the retina to layer 4Cβ, (and to a lesser extent in layers 4A and 6) of the primary visual cortex and then projected to area V4, which is mainly responsible for transmitting information about visual acuity, form vision, colour vision and low contrast targets. Syn. sustained visual system; ventral stream; 'what' system. 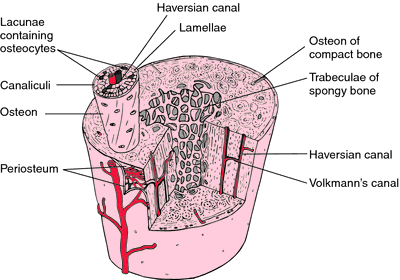 See visual association areas; ganglion cell; P cell; lateral geniculate bodies; two visual systems theory. peripheral nervous system (PNS) The part of the nervous system which consists of the nerves and neurons that are outside the brain and spinal cord. It comprises the cranial nerves, spinal nerves and the autonomic nervous system. The primary role of the peripheral nervous system is to transmit sensory information about the external and internal milieus to the central nervous system and to transmit motor commands to the effectors such as muscles and glands. Note: some authors do not consider the autonomic nervous system as part of the peripheral nervous system. It is, however, a separate entity, which is part central and part peripheral. 'what' system See parvocellular visual system. 'where' system See magnocellular visual system. 1. [TA] Consistent and complex whole made up of correlated and semiindependent parts or functionally related anatomic structures. 2. Entire organism seen as a complex organization of parts. 3. Any complex of structures anatomically or functionally related. 4. Group of people, agencies, institutions, and activities or protocols that together deliver parts of overall health maintenance or intervention to mitigate injury or disease in the general public (i.e., systems of health care delivery). n a set or series of organs or parts that unite in a common function. n the system by which a virtually constant pH level of the blood and body fluids is maintained. The base and acid electrolytes associated with normal metabolism are continuously introduced into the bloodstream. Notwithstanding the marked amounts of base or acid or both introduced into the bloodstream during exercise, rest, hunger, or the ingestion of fluid and solid foods, the pH level of the blood remains rather constant between 7.3 and 7.5. Four means by which this relatively narrow but constant pH level is maintained are: the buffer system of the blood, tissue and cell fluids, and mineral salts of the bone matrix; excretion and retention of carbon dioxide by the lungs; excretion of an acid or alkaline urine; and the formation or excretion of ammonia and organic compounds. n a nondecimal system of weights and measures traditionally used by druggists. See also system, avoirdupois. n See autonomic nervous system (ANS). n a commercial nondecimal system of weights and measures. See also system, apothecaries'. n the brain and spinal cord, including their nerves and end organs; controls all voluntary acts. n the heart and blood vessels. Three major groups of blood vessels are defined: arteries, capillaries, and veins. The system transports metabolites to and from the tissue cells. n an assembly of procedures, processes, methods, routines, techniques, and equipment united by some form of regulated interaction to form an organized whole. It is an approach to a complex problem. n a pictorial diagram illustrating the flow of information into, through, and out of a system of programs. n a term used to describe collectively the blood, bone marrow, lymph nodes, spleen, and reticuloendothelial cells. n the organs and structures primarily functioning in mastication: the jaws, teeth, and their supporting structures; temporomandibular articulation; mandibular musculature; tongue; lips; cheeks; and oral mucosa and their nerve supplies. n a decimal system of weights and measures almost universally used in scientific and professional work, including the writing of prescriptions. The individual units are based on an international set of standards, notably the meter, liter, and kilogram. In dentistry, measurement is done by the metric system. n the system of body structures that provides the energy and movement necessary for the functions of life. The muscles, bones, and connective tissues of the body are grouped together into one system, and they are intimately connected in their individual and combined functions. E.g., for muscle to accomplish its ultimate purpose of movement by contraction, bone, leverage, and connective tissue are required to transmit the force that the contraction generates. In the oral cavity and its related structures the musculoskeletal tissues fulfill the mechanical and structural requirements for movement of the mandible and some related visceral functions, such as respiration and digestion. n the system by which the hormone secretions of the endocrine glands function in part as the regulators of both visceral and somatic function and have intimate anatomic and functional relationships with the nervous system by the union of the pituitary gland and the hypothalamus of the cerebrum. The pituitary gland has a pars nervosa, which is an extension of the anterior part of the hypothalamus, and a pars intermedia, which is an epithelial evagination of the secretory tissue from the stomodeum of the embryo. From its position in the cranial structures in the sella turcica, the pituitary gland regulates, by its union with the nervous system, the whole endocrine system, with its many glands; these glands in turn partially regulate the viscera and somatic muscle organs. n the form or design and arrangement of the occlusal and incisal units of a dentition or of the teeth on a denture. See also system, masticatory. craniosacral division and does not have the simplified structural apparatus of the strong sympathetic adrenal axis about which to function. It inhibits the heart, contracts the pupils, and, in emotional states, produces a vagus-insulin axis of activity. The several parts function rather independently. The ocular division relates to the midbrain, and the bulbar division relates to the hindbrain. The bulbar division supplies the facial, glossopharyngeal, and vagus nerves. It also supplies the secretory and vasodilator fibers of the salivary glands and mucous membranes of the oral cavity and pharynx. In conditions of very loud noise or unusual anxiety states, the parasympathetic system causes unaccounted-for spontaneous urination, excessive salivary and gastric juices, and either nausea or vomiting. n the combination of all the structures involved in speech and the reception, mastication, and deglutition of food. The system is composed of the teeth, jaws, muscles of mastication, epithelium, and temporomandibular joints and nerves that control these structures. parasympathetic system.) It is composed of 21 or 22 ganglia in chains on each side of the spinal cord. The fibers connect with the spinal cord through these ganglia. The actions are closely allied to the action of the medulla of the adrenal gland; thus a sympathetic-adrenal axis that functions as a unit to protect and regulate the body environment may be conceived. The sympathetic control is modified by the volitional somatic control of the patient. The volitional control, superimposed on the autonomic control, gives rise to great variations in motor patterns, as seen in the face in the presence of emotional changes, such as in the blushing of shame and pallor of fear. n in some vertebrates a vascular system with an open end that causes the blood fluid to dissipate into the tissues. This system starts with a maximal head pressure that diminishes until inertia in the blood is overcome. The blood is returned to the heart by muscle function, gravity, and diffusion. The blood pressure in this system fluctuates from a maximum at the heart to a minimum at the tissue cell. 1. a set or series of interconnected or interdependent parts or entities (objects, organs or organisms) that act together in a common purpose or produce results impossible by action of one alone. 2. an organized set of principles or ideas. 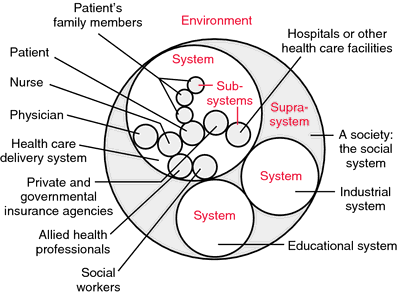 The parts of a system can be referred to as its elements or components; the environment of the system is defined as all of the factors that affect the system and are affected by it. A living system is capable of taking in matter, energy and information from its environment (input), processing them in some way, and returning matter, energy and information to its environment as output. An open system is one in which there is an exchange of matter, energy and information with the environment; in a closed system there is no such exchange. A living system cannot survive without this exchange, but in order to survive it must maintain pattern and organization in the midst of constant change. Control of self-regulation of an open system is achieved by dynamic interactions among its elements or components. The result of self-regulation is referred to as the steady state; that is, a state of equilibrium. homeostasis is an assemblage of organic regulations that act to maintain steady states of a living organism. Definitions of individual systems are to be found under those titles, e.g. alimentary system. a theory of organization proposed by Ludwig von Bertalanffy in the 1950s as a means by which various disciplines could communicate with one another and duplication of efforts among scientists could be avoided. The theory sought universally applicable principles and laws that would hold true regardless of the kind of system under study, the nature of its components, or the interrelationships among its components. Since the introduction of the general systems theory, theoretical models, principles and laws have been developed that are of great value to scientists in all fields, including those of medicine, nursing, other health-related professions, and in veterinary medicine. a system or structure made up of mechanically separable parts, as an emulsion or suspension. a system or structure made up of parts that cannot be mechanically separated, such as a solution.